FUNDED!!! First Stretch goal announced. Thanks to you all, this campaign has now reached minimum funding. Hooray! Of course, we're really just getting started, since there are 19 days remaining in the campaign. I'd love to see this campaign reach 200% or even 300% of the minimum funding goal, by the time it's over. For now, I'll just announce a single Stretch Goal, with more to come, but I'd like to hear Stretch Goal ideas from you backers, first. While I love David Baumgart's "Painted 2D Terrain Hex Tiles" collection, I've always thought that there was one thing missing: rivers. If funding reaches $2600, I'll be adding river overlays to David's Add-On collection (in both the high-res and low-res editions). These rivers are going to be created/generated in Photoshop based on David's existing road artwork, with filter effects applied to effectively turn the roads into rivers. Sixty-two river variants will be provided (straight, curved, forked/joining, etc.). A road and a river, shown here overlaid on a Plains tile. The rivers will be exclusive to the MapForge Add-Ons, since they aren't available elsewhere. Now let's hear your ideas for further Stretch Goals. Keep them reasonable and realistic, as I don't want anything to delay delivery of the rewards. Mark-Ders, snon, and 3 more people like this update. Stretch Goal #1 has just been unlocked. I'll be announcing Stretch Goal #2 tomorrow in another Update. Wow, that'd be cool, thanks for working on it. @David, I'm inquiring about the possibility of getting them colorized and licensed for inclusion in an Add-On. Fingers crossed. Those look nice, thanks for linking them. Sigh. It doesn't really look like we'll be needing a second Stretch Goal. Of course these should be in the Hex March art style to match, but I think the 3D-ish icons would look great. @David, something along these lines? So far all the extra stuff has been for the painted tiles, how about some extras for the Hex March set? I was thinking of better landmark symbols. 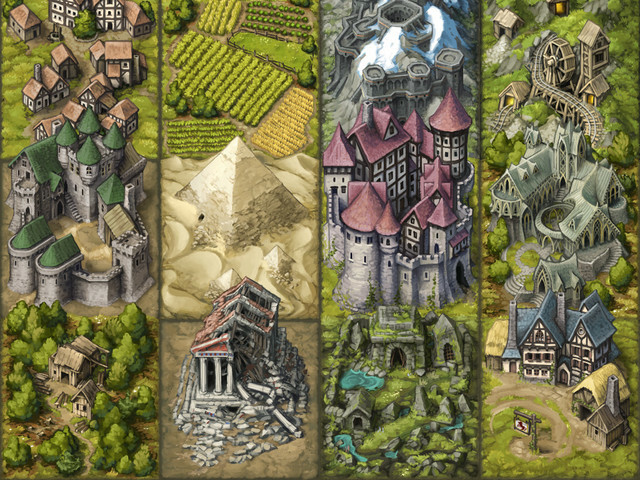 Right now they are plain outlines (for things like cities, ruins, castles, etc), how about a more artistic tile overlay that fits in with the art style of the other tiles? To be clear I am talking something like the city or castle tiles/overlays in the painted set, but in the Hex March style to work with that set of add-ons. @Marty, MapForge currently lets you make a map with a square grid, a hex grid, or no grid at all. There's also a lot you can configure with the grids, such as centerdots/crosshairs, subdivisions, line width, grid color, filter effects (e.g. glow, shadow), etc. It's been suggested that I make a way to link maps, such that when you enter or select a specific area, another map comes up showing that area in more detail. Not sure if that's going to happen, since MapForge isn't a virtual tabletop, hence there's no real need; it would just be a fun way to open another map file, I suppose. Clearly, the different grid types require completely different assets when using a single-tile (cell) approach to asset design. On the other hand, pretty much any large image can work well with either a square grid overlaid on it or a hex grid overlaid. Just a thought- what's the current grid flexibility? 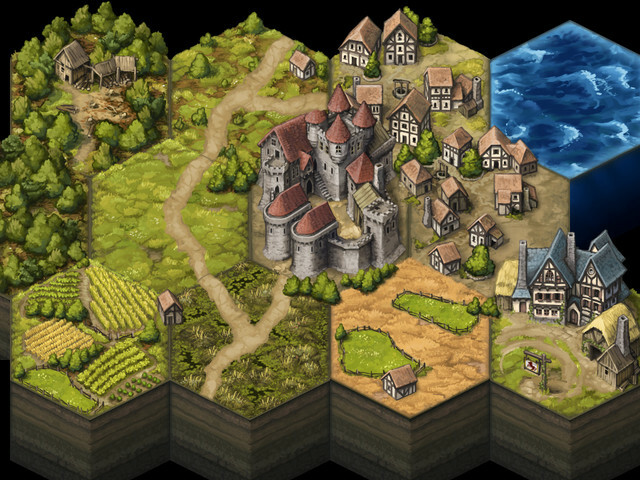 If you had the flexibility (if it's not there already) to do a map as hexes, squares or no grid from the same assets that would be really useful. Again new to it so may already be there but as you suggest in the description for this KS building it up to cover all the main mapping needs of gamers so the range of options such as big or atlas style maps for source/lore material, similar for the journey map that might go with a campaign or adventure, large poster style sheet maps (a sort of gaming mat approach to the map) for the landscape so an ocean or desert or mountainous area etc), hex maps and tile maps, the latter being like the tiles in Descent (the option to add the jigsaw cuts or other custom joins may be too difficult and sometimes you wouldn't want to), I'm guessing the system probably already has much of this flexibility but just thinking about increasing the range of game play, adventure and source book maps you can make with the system and also covering the range of needs from a zoomed in location such as a specific room up to a wider area such as an ocean or a landmass with ways to design the maps to work together or have a thematic link so there's that clear feeling in the game of a mapping system that extends from the immediate area to the wider area where the different maps have an obvious correlation between them..
On a more complex, ambitious level fine-tuning this flexibility may mean working with some of the designers so their are hex, square tile, and something that works for larger more generic areas for each asset (in some cases you couln't just cut the same map up into hexes and tiles due to how they work within the edges. A perhaps less complex solution is to make it possible to use hexes for both the battle/exploration maps that use hexes and the close up tiles that often don't by having 'edge hex' pieces so you can do square/rectangular etc maps still using hexes but with these extra part-hexes to square off the edges, this could solve needing a different set of tiles to use the same art as on hex maps for tile maps. On the river overlay: could also be lava river, which could also work as volcano flow. @Darren, great idea. Which gave me one, too: fords. I'll propose this to David. @Kepli: Sounds a bit much, but have you seen David's other asset packs, for marking resources? Might want to include a few bridges over those rivers, else how does one get from one side to the other without getting wet? - How about boats that can be added to water tiles. 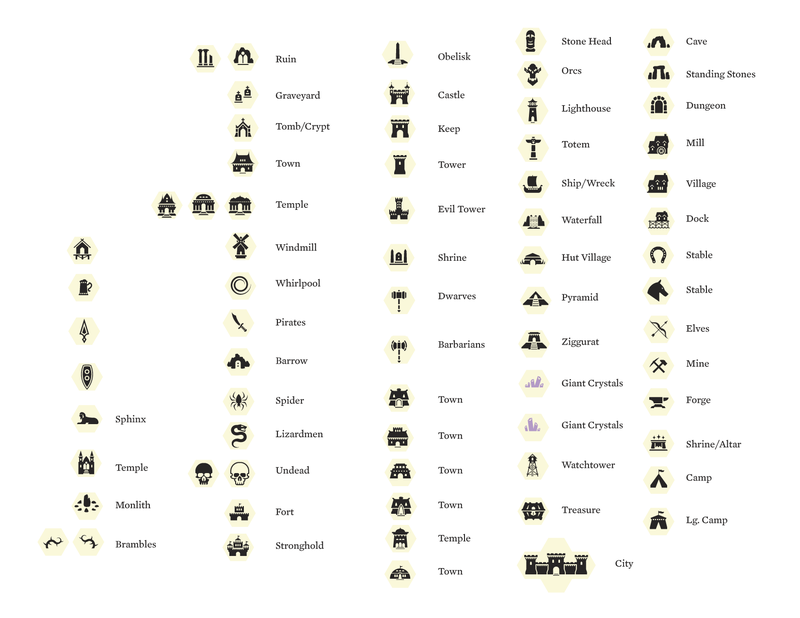 - Tokens to indicate the size of a town/village.